Three-space notchers are groups that consist of a chain on the second line, interrupted by a notch of three empty spaces on the second line and three stones on the third. The term was invented by James Davies. See also Notchers, One-Space Notchers and Two-Space Notchers. The rule for a three space notcher is either "Four die, Six live" or "Five is unsettled". Verify for yourself that Black can live and White can kill by playing at a in the diagram. For this reason a is called the vital point of this formation. See notchers for the coding. 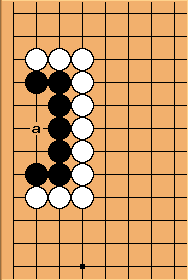 Even if Black takes the vital point at 1, White first destroys eyeshape, then makes miai of a and b. With one of his weak spots occupied by White, the black group's eyespace is almost filled with three in a row. Black still needs to play at 1 to make life.